Teacher Netta's Notes - 100th Day! Tuesday morning was a busy one as we celebrated 100 days of being in school! During our block of work time in the morning, the kids took out their collections of 100 items they brought to school and depending on their grade and age, counted out different piles of a certain number of items. For example, all the Preschoolers separated their items into ten groups of ten things. The Kindergarteners and 1st graders chose which way to separate their items. Some did two groups of 50, others did 10 groups of 10 like the Preschoolers, and some did 4 groups of 25. Our morning took longer than both Teacher Jen and I expected, so the extended day children got to enjoy more of the 100 day activities that we had prepared! The first activity that I showed the afternoon students was a basket of 100 Legos. The task was pretty simple: create a structure out of all 100 Legos. 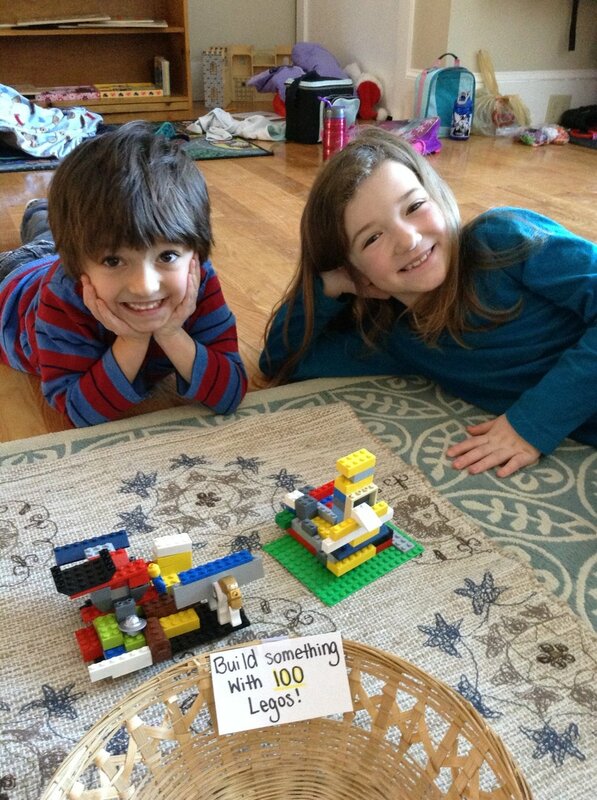 The kids took off with this idea, some making one structure of all the Legos and some sharing with a friend, creating two creations out of 100 Legos. Either way, the objective of this activity was for the kids to use their imaginations and fine motor skills to make something from scratch. Another activity was to create a structure or building with 100 cups! This activity proved to be more of a challenge since the cups easily fell over compared to the Legos. I reminded the students to be gentle and careful while placing the cups where they desired. If a student got frustrated when their tower fell, I encouraged them to keep trying! Some students created a simple tower of cups and others created a scene. One student said she made a queen's tower with water flowing all around it! What great imaginations our students have! I also introduced a roll and race to 100 activity to the afternoon kids. This activity required collaboration between two students. 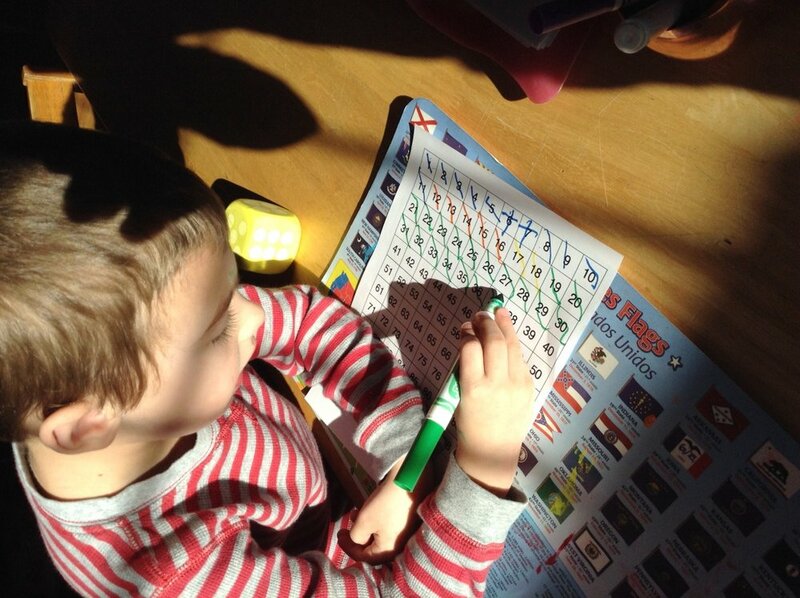 Each child got a 100 grid mat and markers. Child #1 rolled the dice and shaded in how many numbers they rolled. Child #2 rolled the dice next and shaded the number of squares they rolled as well. The first person to reach the number 100, won! This activity practices recognizing the numbers on a dice, counting, and one-to-one correspondence as they practice marking their 100 grid board as they counted the number they rolled from the dice. The last activity that was introduced was a 100 dots hat! Some of the kids were very excited about this activity and showed great enthusiasm throughout. I gave each child 10 strips of paper and had them make 10 dots on each strip. When completed, each child had 100 dots in front of them with their 10 strips of paper. Depending on the age and grade of the child, I had them write "100 days smarter" or the number "100" onto the headband of the hat. I stapled all of the strips of paper onto the headband and then all the ends of the strips together at the top to make a tall dotted hat! It was a very successful 100th day celebration and the kids showed much enthusiasm all day! It's crazy to think that we have crossed our midway point of the year----we have less days to go until the summer than we've already had this year! Before we know it, we will be out for the year! I hope you're all having a fantastic week so far!